Wayne, Pa. (October 10, 2017) — A new proprietary, embossed, induction-seal liner, with a folded pull tab, provides multiple “firsts” for cosmetics, skin care and other personal care items marketed in polyethylene (PE), polypropylene (PP) or polyethylene terephthalate (PET) containers. Luxe® seal liners, from Tri-Seal, a TekniPlex company, provide marketers with another branding surface, and consumers with an “ease-of-use” feature. “Luxe® seal aluminum-foil/foam liners were developed to provide a feature-rich alternative to traditional disc seals. In addition to improved function and safety, they also are an ideal packaging component for those seeking differentiation for their brand. The Luxe® seal liner solution even makes it possible for marketers to eliminate folding cartons for some applications,” explains David Andrulonis, senior vice president and general manager, Tri-Seal. Standard disc liners do not provide tamper or pilfer evidence. 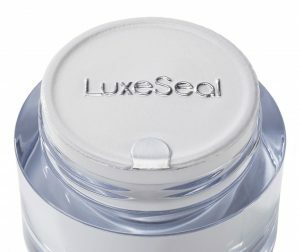 Because Luxe seal is applied via an induction seal, which secures the liner onto the PE, PP or PET container rim, tamper and pilfer evident attributes are now possible. To access the contents, consumers pull up on a folded tab which allows quick and easy liner peel off removal without leaving residue behind. “Luxe® seals also can be embossed with no color, or with silver or gold cold-foil stamping to support brand objectives. This printing feature can vividly stand out through a translucent closure. This capability telegraphs an upscale visual cue to consumers and provides another reminder that they have purchased a product of distinction,” said Andulonis. For those brand owners who are looking to reduce packaging costs and improve their environmental profile, the new Luxe® seal induction seal liner also makes it possible to remove folding cartons from the packaging mix.